Warm, creamy, and just plain delicious! A classic fragrance and best seller, unisex. 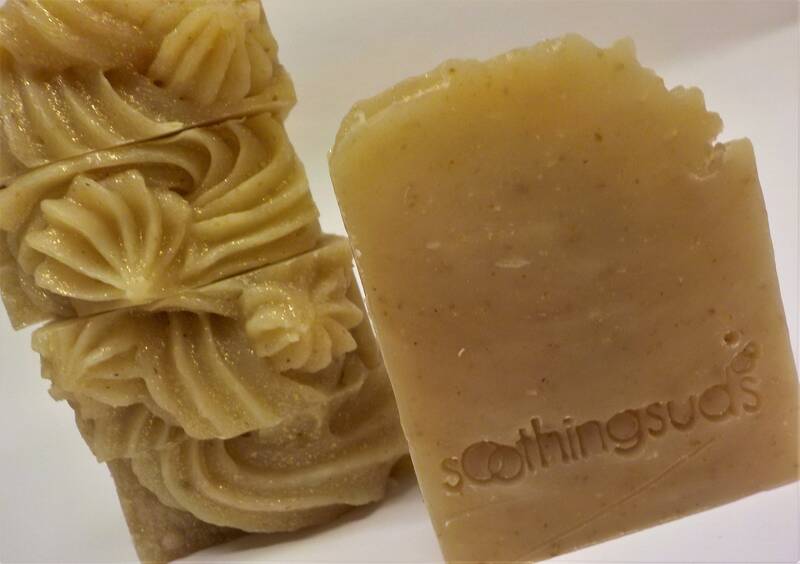 Handmade using the hot-process method of soapmaking our soaps retain all of the naturally occurring Glycerin; a wonderful humectant that leaves your skin soft and conditioned. We have added skin conditioning Goat's Milk , freshly Ground Oatmeal, and fresh yogurt to this soap bar for extra skin soothing benefits. Our finely crafted Olive Oil & Shea Butter formula makes a deliciously rich bar of soap that gently cleanses with lots of thick, creamy, silky lather....for pure soaping bliss! Ingredients: Olive Oil, water, Coconut oil, sodium hydroxide, shea butter, goatmilk , ground oats, fresh yogurt, fragrance, mica, mineral pigment, and/or candy sprinkles and/or body safe glitter.